A recent survey reveals startling results. An overwhelming majority — 76 percent — of enterprises of all sizes reported that customers are not satisfied and are demanding faster and more efficient service. The top four customer complaints companies hear are 1) the technician was unable to resolve the issue during the visit, 2) the technician did not arrive on time, 3) the response time was unacceptable — the time between the customer’s call for service and technician arrival time and 4) improper billing for services. Your field service technicians are often the only touch point you’ll have with your customers after a sale — and it’s clear that customer satisfaction and retention often hinge on the quality of the service this workforce delivers. The number one complaint — inability to resolve the issue during the service call — reaches deep into the pockets of any company with a service organization. Unhappy customers are likely to seek a different vendor for future service needs, resulting in lost customers — and lost revenue. In addition, with each truck roll costing the average service organization $220, additional service calls to get the job done represent a major increase in the cost of doing business, reducing profitability. Improving service and reducing service-related costs is dependent upon how well you can address this long list of issues. 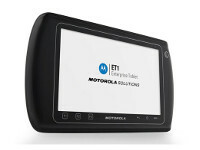 Give your technicians easy access to the rich information they need to get the job done on the first visit with the field-ready Motorola ET1. The ET1 is truly enterprise, a tablet developed by industrial engineers with decades of experience designing mobile devices for business use — including field service. With the ET1 in the hands of your service workforce, your technicians will have the large highresolution display they need to easily view and enter the volumes of data required to get the job done on the first visit. The tough ET1 is built to handle life out in the field, yet offers the same sleek design as today’s most popular consumer-style tablets. In addition, the ET1’s cellular connection allows the real-time exchange of information between service technicians in the field, dispatchers and the parts department inside your facility, enabling the collaboration required to deliver truly impressive service. Fix the issue on the first visit. A fast cellular connection on almost any network in the world provides instant access to a wealth of information right on site, from past service history, equipment manuals and schematics to service level agreements. Arrive on time — period. Assisted GPS provides turn-by-turn directions, even in challenging areas where GPS is typically not available, helping technicians arrive on time and eliminating the lost hours field technicians spend trying to find work sites throughout the day. Present accurate invoices. Automate the capture of billing information to ensure invoices are complete and accurate. The time spent on a job can be automatically calculated based on two taps on the screen — one for start time, one for stop time. Parts can be scanned to capture and document the part number along with the right price. And visibility into Service Level Agreements (SLA) ensures that technicians know whether or not to charge for the work.Real-time payment processing with the optional magnetic stripe reader allows technicians to review the invoice with the customer on the tablet, obtain signature to verify accuracy of charges and charge a credit card, practically eliminating payment disputes. And since invoicing information can be shared with the home office in real time, backend systems are always up to date. Offer additional products that can provide value to customers — and an additional stream of revenue. Every face-to-face visit with a customer is a potential sales opportunity. With the ET1, you can display a detailed, customized list of products and services that are appropriate for each customer to help your technicians become more effective sales people. Technicians can also be prompted to sell new or renew expiring service contracts during the service visit to help customers save money on future repairs, as well as additional products that can increase the value of the equipment or provide a convenient way to purchase needed items.